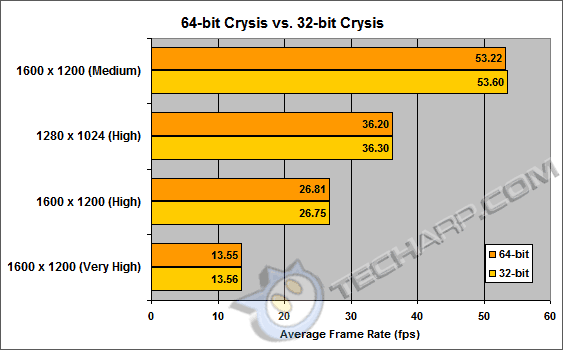 ED#66 : Is 64-Bit Crysis Really Faster Than 32-Bit Crysis? Those who have already given the Crysis single-player demo a try have not only been impressed by the visual effects but also the incredibly stress it put on their hardware. Even a high-end system with the new 3 GHz Intel Core 2 QX9650 (Yorkfield) and an NVIDIA GeForce 8800 GTS 640 MB graphics card can hardly hit the minimum frame rate of 30 fps at 1600 x 1200, and that's without anti-aliasing enabled. In a recent GameSpot interview, Crytek CEO Cevat Yerli mentioned that the 64-bit version of Crysis would be better than the 32-bit version. Here's a direct quote : "...64-bit in general runs better than 32-bit. In fact I would recommend gamers run 64-bit only under very high configurations. We ship both 32- and 64-bit out of box." Before you go rushing off to buy the 64-bit version of Windows Vista though, take a look at what we found when we benchmarked the 64-bit Crysis and compared it to the performance of the 32-bit Crysis. At the resolution of 1600 x 1200, there was absolutely NO difference in performance between the 64-bit Crysis and the 32-bit version. This is quite surprising since the system used is practically built using the latest hardware, including the just-released 45 nm Intel Core 2 QX9650 (Yorkfield)CPU and the NVIDIA GeForce 8800 GT graphics card. This system also had 4 GB of fast DDR2 memory. The only real difference between 64-bit and 32-bit software is the ability to address memory of 4 GB or more. The main advantage of a 64-bit Crysis would be the ability to use larger textures, which would be seen with the settings of High or Very High. Even so, we saw no difference in frame rates. Some of our team members feel that since the game is GPU-limited, the advantage of 64-bit Crysis might not be readily apparent. So, we also tried testing at a lower resolution of 1280 x 1024 but with the High setting (to force the use of larger textures). But as you can see, the results are pretty similar - absolutely no performance difference between the 64-bit and 32-bit versions of the Crysis demo. As far as we can tell, there is no real performance difference between the two versions of Crysis. If your system is not fast enough, moving to 64-bit will not help you. Of course, the performance results using this demo may also not be reflective of the performance of the final build of Crysis. We will only find out for sure when Crysis is released and that isn't far off. Added benchmark result at 1280x1024 at the High setting.